Lirum Device Info by Rogerio Hirooka is an app containing a comprehensive suite of tools that will enable you to monitor the performance of your iOS device, detailing things such as CPU usage and data from sensors like GPS and the accelerometer. With this app, you will be able to view a plethora of system information in real-time. Lirum Device Info displays real-time memory allocation, wireless and cellular network IP, SIM card format, and much more. Furthermore, this app provides a full breakdown of your device's hardware, showing the camera specifications and features, battery life according to various activities, operating and non-operating temperatures, and an overview of CPU and memory specifications. 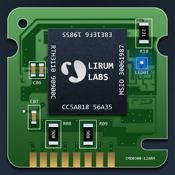 Lirum Device Info was updated to version 1.1 in early-May of 2013. The current version has not yet received enough customer ratings to generate an average score; however, all versions have so far received a total of five customer ratings with an average rating of four out of five stars. Customer reviews have generally quite positive. The information in this app is quite fascinating. You can compare the specs of lots of different devices like iPhones, iPads, iPods, and see how they truly size up against one another. I expected most of the data to make no sense to me at all but everything is actually presented very clearly and concisely, not to mention accurately. For: iPhone 3GS, iPhone 4, iPhone 4S, iPhone 5, iPod touch (3rd generation), iPod touch (4th generation), iPod touch (5th generation), and iPad with iOS 6.0 or later. Lirum Device Info is optimized for iPhone 5. Rebecca, a former police officer, is an experienced writer and editor. She has used all kinds of different tech and prefers Apple products and apps. Her areas of expertise are in all things Apple, health and fitness, the Paleo lifestyle, and legal topics.